Practical Activities and Resources for Families, Teachers and Other Caregivers. Noting that the conflicts arising daily for young children provide an opportunity for adults to model and teach skills for handling conflict peacefully, this guide provides tips for preventing unnecessary conflict, offers “first aid” for conflict moments, and provides resources for addressing common situations that can cause conflict. 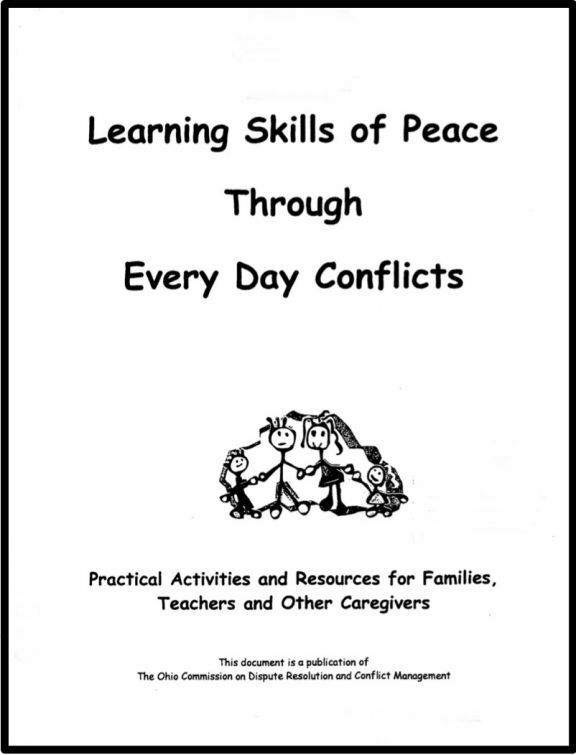 Developed cooperatively by Ohio’s Commission on Dispute Resolution and Conflict Management, Head Start Association, and Department of Education Division of Early Childhood, with implementation facilitated by many Ohio public libraries, the guide is comprised of 40 thematic units of instruction for the early childhood setting, with most units accompanied by home cards providing tips for preventing conflict and suggested activities. Each unit contains information on the importance of the topic for conflict management and its link to peace, suggested books, activities, and copies of home cards. The 40 units cover: (1) anger and aggression; (2) art; (3) bad day; (4) bad language; (5) bathtime; (6) bedtime; (7) behavior; (8) big and little; (9) big brother, big sister; (10) biting; (11) conflict; (12) cultural diversity; (13) death; (14) disabilities; (15) divorce; (16) dressing; (17) family; (18) fears; (19) feelings and emotions; (20) free choice; (21) lying; (22) mealtime at school; (23) mistakes; (24) nap time at school; (25) new baby; (26) teaching the problem-solving process; (27) safety; (28) school; (29) security objects; (30) self-esteem; (31) sharing; (32) siblings; (33) sickness; (34) stealing; (35) stress; (36) tantrums; (37) time out; (38) transitions; (39) whining and nagging; and (40) work. Also included in the guide are additional resources, such as a list of books for each unit, information on child development and child needs from birth to five years, and suggested readings for teachers and parents.